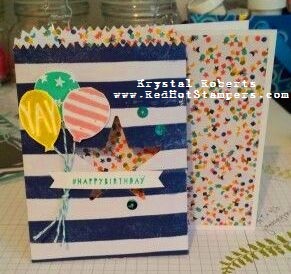 Red Hot Stampers: The Birthday is in the BAG!!! Ok there are some things you see and know immediately that you were meant to be together. The mini treat bag thinlit was one of those love at first sight kind of relationships for me! There are so many pieces that make it so versatile and a very reasonable purchase! And the Birthday Bash DSP?? *GASP* It has little flecks of gold in the confetti and the balloons! Seriously, who's not loving the gold trend right now? LOVE IT!!! So I saw this beautiful (and SUPER quick & easy!) card and gift bag "envelope" if you will at Leadership and knew it was the one. It's a fun card inside a mini treat bag, and it would be a great gift card holder! It was a hit at our February card class and I didn't even mind (very much) cutting my entire package of DSP in half for it. I still need to finish these babies up and put them in my card stash. This one has been waiting awhile but was sent off to my niece for her birthday today! The only thing better than making fun cards is actually sending them off to people I love!